The perfect side dish for your next Asian meal. 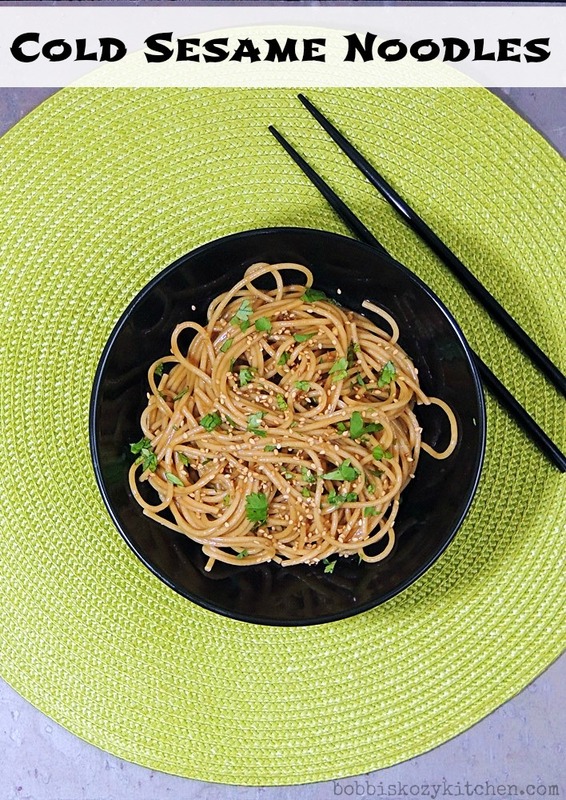 These sesame noodles are wonderful served warm or cold. For this month's Secret Recipe Club I was assigned the blog Feast on the Cheap, written by the mother-daughter duo of Mary Anne and Mariel. Mary Anne has been a caterer for the last 20+ years, and firmly believes that healthy, home-made food doesn't have to take a ton of money or hours spent in the kitchen. Mariel has grown up with her mother's fabulous cooking, which has opened her up to experimenting with different flavors, textures, and cuisines. Their blog not only contains amazing recipes like Pear, Pancetta & Gorgonzola Quiche with Toasted Walnuts, Cinnamon-Spiced Lamb Meatballs with Tzatziki, Honey & Butter-Glazed Pretzel Bites with Roasted Garlic , and Gourmet Pizza with Gruyere, Crispy Prosciutto and Caramelized Onion Puree. And that just scratches the surface of the fabulous food they share. Then there is the gorgeous photography. Seriously eye-popping, mouthwatering photos that will stimulate anyone's appetite! I really wanted to make their Quiche with Caramelized Onions, Mushrooms, and Ham (if you go look at the picture you will completely understand why), but my landlord has yet to fix my oven so no baking for this girl. It is going on 3 weeks now and I am seriously annoyed!! You can bet your booty I will be making it as soon as my oven is fixed though. This recipes is, just as they advertise, simple, inexpensive, and full of flavor. I made it as a side for my Chicken Satay with Spicy Peanut Dipping Sauce and it was absolutely perfect. As a matter of fact, Kevin ate 3/4 of the noodles himself!! Even as I was writing this post he walked by, saw the picture, and said, "WOW that dish was soooo good!". So don't take my word for it, listen to Kevin! Make this dish ASAP, and make sure to head on over to Feast on the Cheap. Just have a napkin ready because you will be drooling, I promise!! Bring a large pot of salted water to a boil and cook the noodles until according to package directions, drain. Return the noodles to the pot and toss with 2 tablespoons of sesame oil. Set aside. In a small bowl, whisk together 2 Tablespoons sesame oil, soy sauce, rice wine vinegar, peanut butter, honey (or agave nectar), sesame seeds, garlic, ginger. Toss the noodles with the sauce. Sprinkle with scallions and garnish of your choice. Serve cold or at room temp. Now check out the other terrific Secret Recipe Club members dishes. Wow, I think I have everything to make these. They sound incredible - pinning to make once the lasagna, leftover spaghetti carbonara, and an entire turkey have been eaten. I think I may have overcooked on the weekend - lol! I can't believe your landlord hasn't fixed your oven for a full three weeks - that's nuts! I'd go nuts! In any event, thank you so so much for the kind words, your photos are gorgeous. I love sesame noodles, but I hate that you made them because you don't have an oven!! You should share the landlords email address and let us all bombard them with complaints! I will be trying this recipe with tahini, never done that before, sounds divine! I so might make these for lunch today, they sound wonderful! Great pick! these look soooo good! i love this idea and something that i wouldn't really ever think to make! great pick! Yum! That looks so good! :) Good job! No oven?? Goodness gracious, I hope your landlord gets his/her act together...but this is an awesome compromise. Love cold sesame noodles! These look so good. I love cold noodles. And with all those flavors?? Yes please.